One of the many things that my family is so engaged with is foods! Having a husband Chef, experimenting on delectable dishes has always been a worthwhile experience. On our recent trip to Bangkok, one of our objectives is to try lots of Thai dishes as appreciating Thai foods is one good way of understanding Thai culture. Walking around the MBK mall area, we spotted this restaurant serving both Thai and Chinese dishes. They do serve roasted ducks, too. 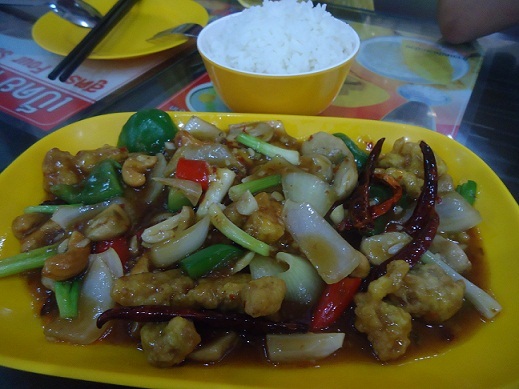 Looking at the menu, I suddenly felt attracted with Stir Fried Chicken with Cashew nuts and dried pepper. So without thinking much, I straight away order this dish. My son Edmar tried their version of Hainanese chicken and my daughter Mika opted to try a small order of roasted duck. The Hainanese chicken doesn't look so appealing to me. Some more, it comes with a very small serving. So among the three dishes that we ordered, the stir fried chicken with cashew nuts was a stand out. I came to know later that this dish which I truly loved is a very common Thai dish and very easy to prepare, too. As I wanted to try cooking it myself, I have scouted for it's recipe. If you are interested too, you can check the recipe here. Should I add that the prices of foods in that restaurant wasn't too bad at all. I paid THB380 (around $13) for the 3 dishes plus 2 orders of soft drinks. I want to add that I like their steam rice, too. Perfectly cooked! If you happen to visit Bangkok, this restaurant is just situated right in front of the over pass opposite MBK mall. Please stay tune for more of our Bangkok adventures. That chicken sure looks yummy! But you know, I haven't been impressed by Thai foods and I hope that it will change. Kasi there was a time for the very first time when I and my hubby decided to dine at a Thai resto at MOA but we werent delighted by the orders we had. 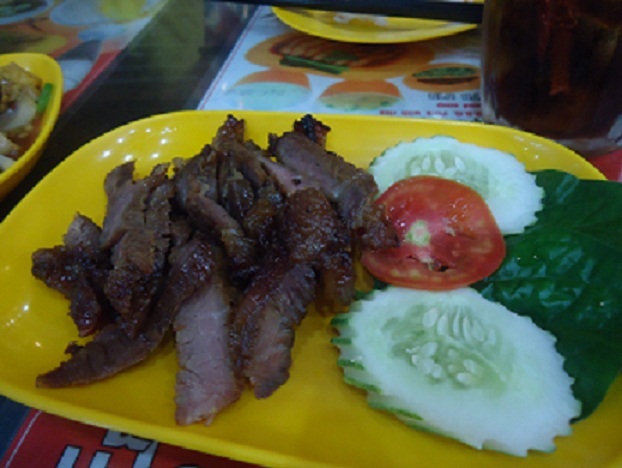 It was an awkward taste for a binagoongang pork to mix mint with it. The rest of the viand were so-so din. Kaya we hope to be tasting better dishes from them. We hope so.